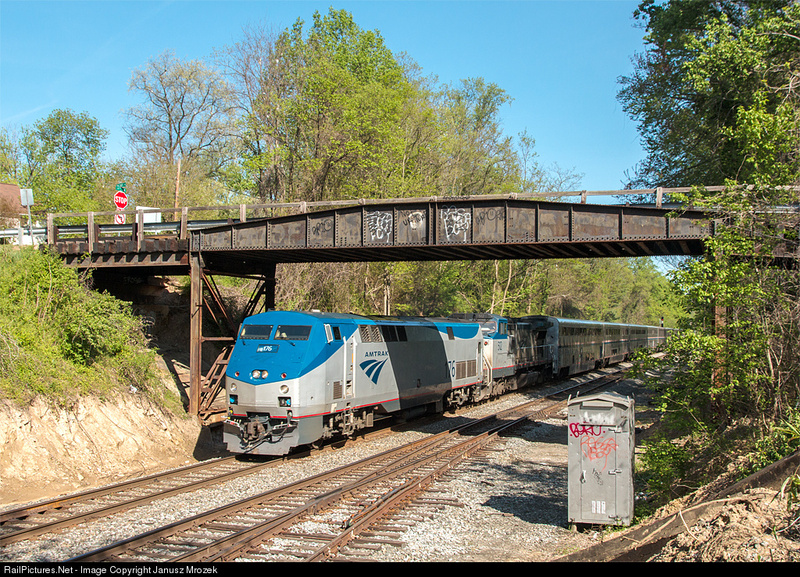 Amtrak train 29, the Capitol Limited, heads west under the Talbot Avenue Overpass in April 24, 2016. Photo by Janusz Mrozek, used with permission. Pony plate girder with wooden deck, reputed to be a former railroad turntable bridge removed from a roundhouse turntable at Martinsburg, West Va. and reinstalled here "upside down" in 1918. "The Maryland Transit Administration has agreed to save the steel girders from the Talbot Avenue bridge, a 100-year-old span in the Lyttonsville area of Silver Spring, when it’s torn down to make way for the light-rail line, the county said. . . . The girders will be installed on a vacant state-owned parcel about two blocks from the bridge, near Talbot and Michigan avenues. They will form short walls on both sides of the Capital Crescent Trail to give runners and cyclists the feel of crossing a bridge." The Maryland Transit Administration has agreed to save the steel girders from the Talbot Avenue bridge, a 100-year-old span in the Lyttonsville area of Silver Spring, when it's torn down to make way for the light-rail line, the county said. . . . The girders will be installed on a vacant state-owned parcel about two blocks from the bridge, near Talbot and Michigan avenues. They will form short walls on both sides of the Capital Crescent Trail to give runners and cyclists the feel of crossing a bridge.